Performance of the respiratory navigator is critical in coronary magnetic resonance angiography (MRA). At 7 T, the performance of a conventional 2D-selective navigator is adversely affected by field inhomogeneities and limited volumetric coverage of transmit/receive surface coils which must be used on systems without transmit array capability. Therefore, two navigator approaches, a 2D-selective navigator optimized for 7 T and a non-selective navigator that is less susceptible to field inhomogeneities, were implemented. Coronary MRAs were obtained with both techniques and quantitatively compared. To compare 7 T coronary MRAs obtained with an optimized 2D-selective and a new non-selective navigator approach. 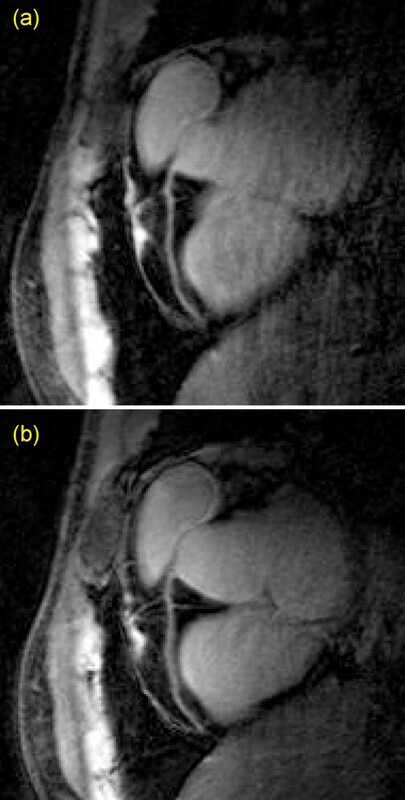 Coronary MRAs of the right coronary artery (RCA) were obtained in seven healthy volunteers (23 ± 3 years) during free breathing on a commercial Philips Achieva 7 T whole body MR scanner. The scans were performed using a custom-built quadrature transmit/receive surface coil (two overlapping 13 cm diameter elements). A 3D gradient echo sequence (TR = 4.3 ms; TE = 1.38 ms; α = 15°; acquisition window = 107.5 ms; voxel size = 0.82 × 0.86 × 2mm3; gating window = 3 mm; adiabatic fat saturation; saturation band over anterior chest wall) with a non-spatially selective navigator and a 7 T-optimized 2D-selective navigator was used. Optimizations of the 2D-selective navigator included localization at the lung-heart interface to account for limited transmit/receive surface coil coverage, reduced duration of RF pulse (4.38 ms) to minimize T2* effects and an RF excitation angle of 25°. The non-selective navigator replaces the pencil beam excitation in the pulse sequence (Figure 1). Signal for the non-selective navigator was spatially constrained by the sensitivity profile of transmit/receive surface coil and by a saturation band (Figure 2). An RF excitation angle of 15° was used for the non-selective navigator. SNR, CNR, coronary vessel length, diameter and sharpness, acquisition time and navigator efficiency were compared using the Wilcoxon matched-pair test. Pulse sequence diagram for (a) 2D-selective navigator and (b) non-selective navigator. Timing diagram for (a) 2D-selective navigator and (b) non-selective navigator. All scans were successfully completed with both navigator approaches. An RCA acquired with both techniques in the same volunteer is shown in Figure 3. Quantitative results are listed in Table 1. Although there was a tendency for improved image quality using the optimized 2D-selective navigator, no statistically significant difference was found between the two approaches. Results from quantitative data analysis of coronary MRA. RCA: right coronary artery, SNR: signal (blood pool in aorta, near the offspring of the RCA) to noise ratio, CNR: Contrast (between blood pool and myocardium) to noise ratio. Reformatted RCA using (a) 2D-selective pencil beam navigator and (b) non-selective navigator. The use of navigator technology for respiratory motion suppression at 7 T is not straightforward. However, 7 T-specific optimizations of the 2D-selective navigator and coil related modifications in navigator localization permit the reliable acquisition of free-breathing coronary MRA at 7 T. The new non-selective navigator is a simple valuable alternative and its coronary MRA image quality approaches that obtained with the 2D-selective navigator.